Well the season here is about over. The final group for the year is here right now. I closed down 2 of the cabins yeserday. I want ot stay ahead of the cold weather so I do not end up with frozen pipes, althouth the fall weather has been warmer than quite a bit of the summer. it does look like a fall day here this morning, cold foggy and not sure wether it is a misty rain or a few snow flakes in the air. It has been a good summer, we have been happy to see old and new groups as they arrive and would like to thank everyone for helping to make it another successful year. 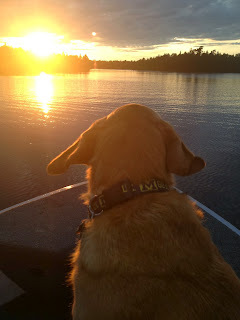 I would also like to thank everyone for the pictures that they have given me , it helps keep this blog site possible. Also could not have made it through the season without all the help and support from Sue, Emily and Christine. Of course I am not finished with projects yet, but they will get done, I have been getting my trapping supplies ready for the upcoming season the last few days instead of the projects around the camp. I hope to stre trapping around the 15th of Oct. right after Thanksgiving, yes Thanksgiving is at a different time here than the states. Hopefully I will not have pictures of snow and ice too soon, but I know it is on its way ready or not. Have a good winter , will keep you posted through out! This is the new Champ fish finder, by the looks of the fish Kevin and his family have been catching the new style fish finder woorks very good! 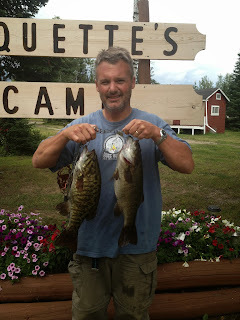 Kevin and his family caught this nice Pair of Small Mouth Bass while at Paquette's Camp, they have both been released back into Wangoon Lake. Thanks for practising catch and release guys. Brent and the guys get their annual group picture in front of a local trappers cabin. Not sure if this is before or after they got their Moose, don't see any blood on their clothes. Well the Moose has been cut into pieces and is now ready to get to the truck, all the work begins once the Moose is on the ground. Brent took this nice Bull at about 40 yards with his bow! Congratulations Brent. Landon shows off his uncle's Moose while on a Moose Hunt at Paquette's Camp, Nice Moose Brent. Now comes the work , getting it back home.